The film opens with a black screen, with only the sound of a person deeply breathing, coughing, thumping and scratching on wood, then a more panicky breathing before the flame of a zippo lighter illuminates a man, with hands tied in cased in a wooden coffin. 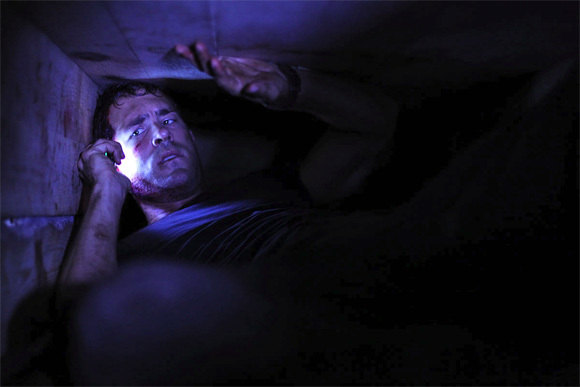 Paul Conroy (Ryan Reynolds), frighten and disorientated awakens to find him self buried alive with only a lighter, a knife, a flashlight, glow sticks, a pencil and a cell phone. In the tight space he manages to find these items around him. The cell phone is in Arabic, but he calls out to anyone he knows to report that his convoy of trucks in Iraq was ambushed and for some reason he's buried. In typical bureaucracy the 911 operator on the phone doesn't believe him and he's put on hold while the battery is dying. His capturer (voice of Jose Luis Garcia-Perez) calls him with a demand of a few million dollars in ransom. They don't want to know that he was just delivering kitchen supplies to an Iraqi community center. His kidnappers are not interested and just want to blame him as an example of US culpability in their countries woes. They tell him to make a video with the phone of him reading their propaganda and the demand for money. Conroy eventually calls the US State Department and the Hostage Working Group Dan Brenner (voice of Robert Paterson) who both tell him that the US doesn't negotiate with terrorists. A cold-hearted representative (voice of Stephen Tobolowsky) of his company tells him that he's been downsized and his capture isn't covered in their policy. Director Rodrigo Cortés and screenwriter Chris Sparling have created a taut thriller utilizing one small space that takes the audience on an edge of the seat ride. Ryan Reynolds can finally shake off the rom-com and superhero stereotype that he's been associated with these past few years. The whole movie was filmed in 17 days with just Reynolds in an actual box constructed with wood and a glass side. There's no explosions, car chases, love scenes, or a ton of exposition to wade through to set up the story. The viewer is subjected to the horror of Conroy's predicament from the moment he awakens to the very end. Your mind may race to explore what you would do in the same fix and Reynolds keeps one glued to the screen while he's doing them. You live with his fear and his frustration when trying to call out for help. He runs the gambit of terror, anger, panic, desperation and sadness in the movies' 94 minutes of running time. And you will be so glad to get out of the dark theater when it ends.